(autoinsidernews) - On Friday, General Motors unveiled the 2007 Chevrolet HHR Panel, which has been designed to suit various commercial and private uses, reports Trend. The HHR Panel features windowless side panels, with steel inserts in place of side windows, and rear cargo doors in place of the conventional doors. 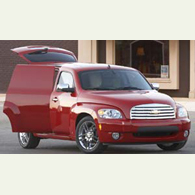 The cargo doors open wide to enable cargo access from the sides, in addition to access through the rear liftgate. The cargo doors don't have external handles but are opened via a dashboard release button. The HHR Panel features a flat load floor, with provides more than 57 cubic feet of cargo space, and about 6 cubic feet of additional covered, under-floor storage. The HHR Panel is a model unlike anything else in the segment, and it continues HHR's mission of offering customers a bold, expressive, functional and different vehicle, said Ed Peper, Chevrolet general manager. It's great for delivery companies and other small businesses, but we think auto enthusiasts will love it too, as it gives them a large canvas on which to express their individuality. HHR Panel production is expected to start late in the first quarter of 2007, and will be offered in LS and LT trims, powered by 2.2L and 2.4L engines both delivering 30 mpg in highway driving. Business customers will see great value in the HHR Panel, said Peper. There aren't many vehicles designed for commercial use that provide 30 mpg.